Protect your iPhone 6, 6s or 7 in this customizable LEGO® Phone Cover with Studs, featuring a durable phone cover with an integrated baseplate and 47 loose LEGO elements. Build one of three mosaic suggestions or create your own personal designs. Add the arm element and you have an integrated stand for hands-free viewing of your favorite movies. Price is 10% below the initial Lego retail price, a € 3.00 discount! This comes down to 58.67 cent per brick. 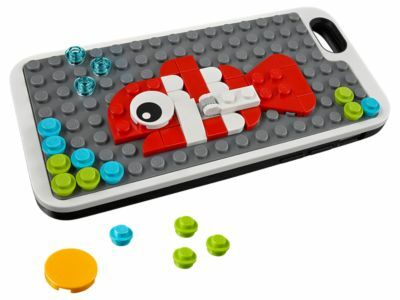 The Phone Cover with Studs (853797) Lego set is available from the sites below. However, they do not offer delivery to your selected region. Alternate description Smarten up your smartphone—LEGO® style! Features a durable phone cover with an integrated baseplate and 47 loose LEGO® elements. Suitable for iPhone 6, 6s and 7. Build one of three mosaic suggestions or create your own designs to personalize your phone cover. Add the arm element and you have an integrated stand for hands-free viewing of your favorite movies. Measures over 7” (20cm) high, 4” (11cm) wide and under 1” (2cm) deep.